How do you make sure the dog you love never bites anyone (again)? Kari and Rob are as devoted to their German shepherd puppy, Isis, as two dog parents can be. Kari's the disciplinarian, struggling to follow every instruction to the letter. Rob's the laid-back dad, more of a littermate, happy as long as he can practice jiu-jitsu with the dog. As she grows, Isis's behavior escalates from frustrating to dangerous when she bites someone. Kari and Rob learn that some of the old-fashioned advice they followed may have contributed to Isis's aggression. Eventually, they're shown a better way to calm an anxious and fearful dog. 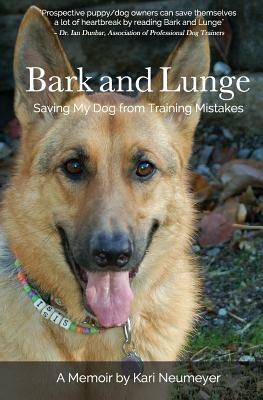 "Prospective puppy/dog owners can save themselves a lot of heartbreak by reading Bark and Lunge, which tells the story of what can go wrong when a puppy is not properly socialized and when unsuspecting owners are bullied into using aversive training techniques." - Dr. Ian Dunbar, founder of the Association of Professional Dog Trainers "Kari and Rob's love for their German shepherd Isis shines through every page of this moving saga. Their journey through various training techniques and treatments is a testament to their relentless dedication to help Isis to live a normal life. Many dog owners will relate to their story, and even those who can't will empathize and find it a fascinating read." - Nicole Wilde, author of Hit by a Flying Wolf: True Tales of Rescue, Rehabilitation and Real Life with Dogs and Wolves.